The Artful Sailor’s Guide to Sewing Machine Maintenance, Adjustment and Sewing Skills. Many sail and canvas projects can be done with a basic domestic sewing machine. Heavily built, yet portable, vintage machines are inexpensive and can be hot-rodded for small craft sailmaking and sail repairs as well as bags, sail covers and awnings. 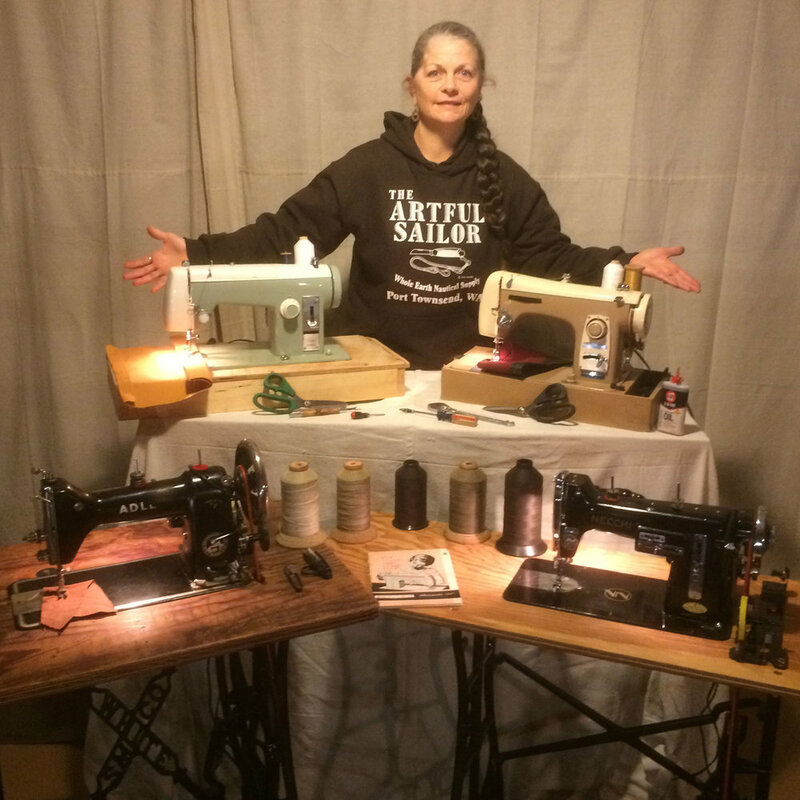 By popular demand, The Artful Sailor Whole Earth Nautical Supply is excited to host a one-day, basic course for machine-oriented Stitchmates who want to learn how to put that old machine in the closet to use both onboard and ashore. Let Emiliano Marino, author of the The Sailmaker’s Apprentice, and his crew walk you through the mysteries and routine care of the average home sewing machine. Everyone will be provided with and learn to sew a special instructional project designed to open the door for future sail and canvas work. An operable, portable, home sewing machine. (Pre-1970 Singer, Kenmore, Adler, Pfaff, Necchi, Brother, etc.) Straight stitch or zigzag. Don’t have a machine but want to take the class? The Artful Sailor will have on hand five classic machines for student use and demonstrations. If you’ll need a machine, please advise in the registration form. Three of the shop machines are treadle-powered and everyone will have a chance to sew under their own steam just like Gramma, and everyone, did after the invention of the sewing machine but before the advent of electric motors. YES, please reserve me one of yours. NO, I've got my own to bring. Full refunds to registrants if workshop is cancelled and to registrants who withdraw prior to registration deadline.